John Locke (pronounced /lɒk/; 29 August 1632 – 28 October 1704) was an English philosopher. 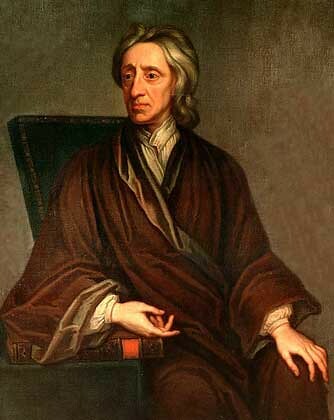 Locke is considered the first of the British empiricists, but is equally important to social contract theory. His ideas had enormous influence on the development of epistemology and political philosophy, and he is widely regarded as one of the most influential Enlightenment thinkers, classical republicans, and contributors to liberal theory. His writings influenced Voltaire and Rousseau, many Scottish Enlightenment thinkers, as well as the American revolutionaries. This influence is reflected in the American Declaration of Independence. Locke's theory of mind is often cited as the origin for modern conceptions of identity and "the self", figuring prominently in the later works of philosophers such as David Hume, Jean-Jacques Rousseau and Immanuel Kant. Locke was the first philosopher to define the self through a continuity of "consciousness". He also postulated that the mind was a "blank slate" or "tabula rasa"; that is, contrary to Cartesian or Christian philosophy, Locke maintained that people are born without innate ideas, and that knowledge is instead determined only by experience derived by sense perception. Locke's father, who was also named John Locke, was a country lawyer and clerk to the Justices of the Peace in Chew Magna, who had served as a captain of cavalry for the Parliamentarian forces during the early part of the English Civil War. His mother, Agnes Keene, was a tanner's daughter and reputed to be very beautiful. Both parents were Puritans. Locke was born on 29 August 1632, in a small thatched cottage by the church in Wrington, Somerset, about twelve miles from Bristol. He was baptized the same day. Soon after Locke's birth, the family moved to the market town of Pensford, about seven miles south of Bristol, where Locke grew up in a rural Tudor house in Belluton. In 1647, Locke was sent to the prestigious Westminster School in London under the sponsorship of Alexander Popham, a member of Parliament and former commander of the younger Locke's father. After completing his studies there, he was admitted to Christ Church, Oxford. The dean of the college at the time was John Owen, vice-chancellor of the university. Although a capable student, Locke was irritated by the undergraduate curriculum of the time. He found the works of modern philosophers, such as René Descartes, more interesting than the classical material taught at the university. Through his friend Richard Lower, whom he knew from the Westminster School, Locke was introduced to medicine and the experimental philosophy being pursued at other universities and in the English Royal Society, of which he eventually became a member. Locke had been looking for a career and in 1667 moved into Shaftesbury's home at Exeter House in London, to serve as Lord Ashley's personal physician. In London, Locke resumed his medical studies under the tutelage of Thomas Sydenham. Sydenham had a major effect on Locke's natural philosophical thinking – an effect that would become evident in the An Essay Concerning Human Understanding. It was in Shaftesbury's household, during 1671, that the meeting took place, described in the Epistle to the reader of the Essay, which was the genesis of what would later become the Essay. Two extant Drafts still survive from this period. It was also during this time that Locke served as Secretary of the Board of Trade and Plantations and Secretary to the Lords and Proprietors of the Carolinas, helping to shape his ideas on international trade and economics. Shaftesbury, as a founder of the Whig movement, exerted great influence on Locke's political ideas. Locke became involved in politics when Shaftesbury became Lord Chancellor in 1672. Following Shaftesbury's fall from favour in 1675, Locke spent some time travelling across France. He returned to England in 1679 when Shaftesbury's political fortunes took a brief positive turn. Around this time, most likely at Shaftesbury's prompting, Locke composed the bulk of the Two Treatises of Government. Locke wrote the Treatises to defend the Glorious Revolution of 1688, but also to counter the absolutist political philosophy of Sir Robert Filmer and Thomas Hobbes. Though Locke was associated with the influential Whigs, his ideas about natural rights and government are today considered quite revolutionary for that period in English history. However, Locke fled to the Netherlands, Holland, in 1683, under strong suspicion of involvement in the Rye House Plot (though there is little evidence to suggest that he was directly involved in the scheme). In the Netherlands Locke had time to return to his writing, spending a great deal of time re-working the Essay and composing the Letter on Toleration. Locke did not return home until after the Glorious Revolution. Locke accompanied William of Orange's wife back to England in 1688. The bulk of Locke's publishing took place after his arrival back in England – his aforementioned Essay Concerning Human Understanding, the Two Treatises of Civil Government and A Letter Concerning Toleration all appearing in quick succession upon his return from exile. He died in 28 October 1704, and is buried in the churchyard of the village of High Laver, east of Harlow in Essex, where he had lived in the household of Sir Francis Masham since 1691. Locke never married nor had children.